Daily format with half of each day for meetings/appointments, the other half for "To Do", Notes and Lists. 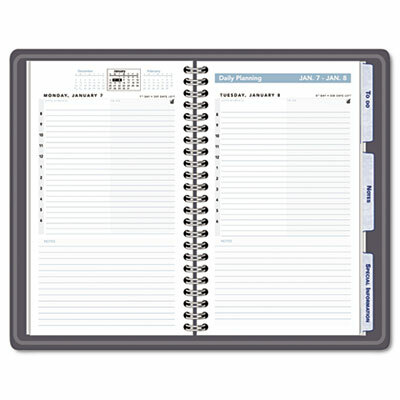 Features tabbed sections for Special Information, To Do, and Notes. Tabbed Special Information Section includes 800 numbers, Future Planning, Web Addresses, and Four-Color World Map. Storage pocket for important papers and business cards.